Yukon Medical has been a leading developer of innovative pharmaceutical services since 2008. But their legacy product and quality systems were not built to keep up with the rate of their success. In this case study, uncover how a product lifecycle management (PLM) and improved quality management system (QMS) from Propel helped Yukon Medical manage their training process and scale to fit their current—and future—business goals. 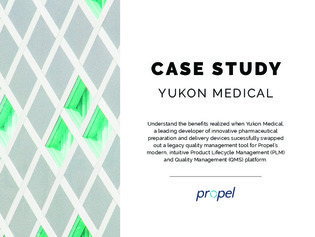 Download now to explore the benefits of Propel’s PLM and QMS, and discover how Yukon Medical succeeded by switching their legacy systems to Propel.